When it comes to selling a home, you may be focused on renovations and smaller, but still time-consuming, upgrades like painting. The only problem with these improvements? You can’t take them with you! These 30 upgrades will not only help you sell your home, you can also move them with you guilt-free – something you can’t do with those new cabinets you’re installing. One of the best tips for staging your home to sell it is to add lighting. While it’s easiest to simply open up the curtains, it can’t hurt to add more (and better!) lighting inside the room itself. Invest in new lamps and brighter LED lightbulbs to boost the brightness in your space. Pick portable plug-in options, and nobody will be surprised when you take it with you. While you’re at it, consider light strips and other unconventional interior lighting options. Adding plug-in LED light strips to the bottom of a counter or the interior of a closet brightens these spaces – and they can be packed away when it’s time to move. Another easy upgrade you can make is to your window treatments. Replace outdated or faded curtains with new ones that let in more light. As long as you aren’t installing a new fixture, such as a window cornice, you are generally okay to take removable window treatments with you. You can also brighten up your space by using mirrors as a focal point. Rather than using art or family photos that some potential buyers may not like, a large mirror can draw the eye while also making a room look larger. For many, the dining area and kitchen are the heart of the home, and small items that are both decorative and functional can make these spaces feel livable and inviting. Set the dining room table with dishes, placemats, and napkins that complement the room’s decor, with a vase of silk flowers or a tasteful, non-perishable centerpiece to tie the space together. In the kitchen, buy some new bar stools to tuck under the breakfast bar or set beside the island. A bottle of olive oil, a few jars filled dried beans or lentils, or a colorful serving platter can add selective pops of color to accent white cabinets. During open houses or on days with showings, a decorative bowl containing a few oranges will bring pleasant smells to either space, and can be eaten as a snack afterward when discussing feedback with your real estate agent. A quick way to spruce up a living space is to add a new rug. Replace old, faded rugs with a new one – or add a bit of softness to an uncarpeted room. While you should pick something relatively neutral, make sure you select one that you like so that you can repurpose it in your new home. Similarly, a few hardback books can add visual interest and a sense of scale to empty built-in shelves. While you’re polishing up your space, add some greenery to the indoors with a few well-chosen houseplants. Easy-care succulents or gorgeous orchids can liven up a space, both before and after you sell your home. Planning to stage your home for sale? Make sure you follow these do’s and don’ts for staging a home! Make your bedrooms look extra-luscious with new, neutral bedding. A cozy white comforter can be covered with a duvet once it’s done its job of selling your home. Another easy upgrade you can use down the road is new bed frames or headboards. Select a stylish, neutral option you like now – and then use it in your new home after you move. An easy way to make the bedroom feel more relaxing is to add a small sitting area with a bold statement chair or small-scale loveseat or bench. It’ll do double-duty in your new home as a piece of furniture you can use daily. While you’re at it, consider upgrading your hampers. A woven basket-style hamper (with a lid, please!) can stay in place during showings, too. Give potential homebuyers that spa vibe with brand new, fluffy white towels. During open houses, stash away your everyday towels and put out the nice, unused towels. Then, when you move, you’ve already treated yourself! Another simple upgrade you can make to your bathroom is to swap out your old toothbrush holder, soap dispenser, and soap dish with new, matching bathroom accessory sets. Provided they’re not attached, they’ll be yours for everyday use after you move. And please, put some fancy (and unused!) soap in the soap dish before an open house. Hide away that bar of Ivory for now! Nearly any porch, patio, or deck can be improved with seating options. Make the most of your space with tables, chairs, and umbrellas, showcasing your home’s outdoor space. Add a festive touch with some outdoor lighting, such as string lights. Small touches like this can help the future owner see themselves entertaining there. And when you move, you can use it to entertain guests in your new space! Your front porch is a key element to creating curb appeal. Add some greenery with a small potted shrub – provided it’s moveable, it’ll be yours to take. Spice up your space with a new welcome mat to greet open house visitors. Select something cheery that you like and will use later. Welcome visitors with a wreath on the front door. Preserved flowers, herbs, grains, or branches are available to suit any season, or choose an item crafted of fabric, fiber, or other materials. Improve This Home…and Your Next One! 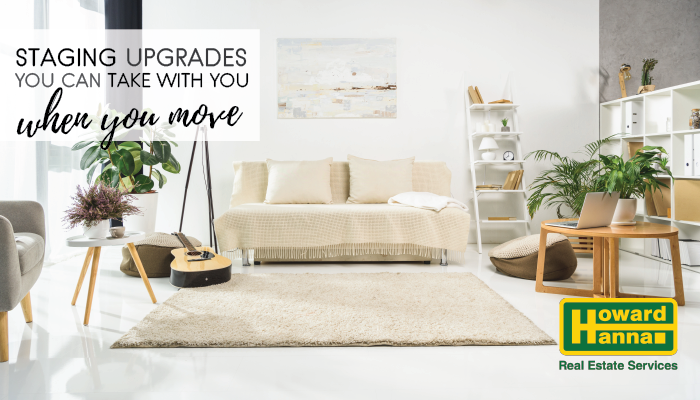 When it comes to making upgrades to your house, it can be easy to focus on major renovations and other projects. But simple staging tools can help you sell your current house – and can be put to good use in your next one. Only have a few minutes to stage your house? Make the most of your time with these quick tips for staging a home!